Effective anti-microbial, anti-parasitic, anti-septic, anti-spasmodic, sedative. Recommended to use for bunions, calluses, fungal infections and corns, skin diseases, colitis, eases phlegm. The tea has been used for stomach problems, colds & respiratory inflammation. Highly valued as an insect repellant, as a topical antibiotic for open sores, wounds, skin ulcers and gangrene. It is toxic to insects – it repels bed bugs, lice, mosquitos & fleas as well as common household pests like cockroaches, ants & termites. Protects from common airborne diseases. Tagetes is an annual herb that grows to about 30 cm in height. It has bright orange daisylike flowers and soft green oval pinnate leaves. 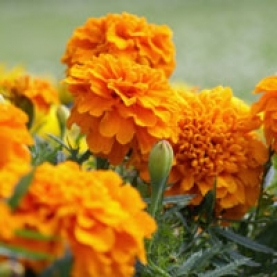 Often referred to as (Mexican) Marigold, and wrongly referred to as Calendula. This species is considered a noxious, invasive plant in some areas. It is known by other names: Khaki Bush & Mexican Marie Gold. The flowers have traditionally been decocted and used for whooping cough, colic, mumps, sore eyes, colds, and mastitis. Often used for flavoring tobacco. It is also used in chicken feed, to to give the egg yolks a brighter yellow hue and enhance the color of the chicken skin. Its sedative qualities soothe the neurotic & nervous systems, beneficial for anxiety, stress, depression, anger, panic and other psychological imbalances.